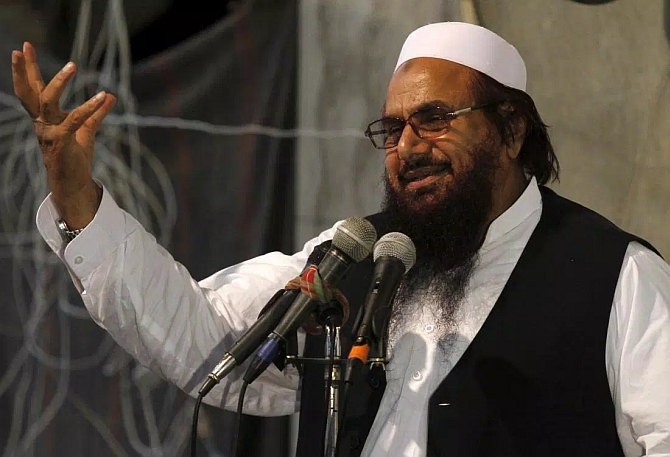 Mumbai attack mastermind and Jamaat-ud-Dawa chief Hafiz Saeed, who is under house arrest, has now been listed under Pakistan's anti-terrorism act, a tacit acknowledgement of his links to militancy. Dawn News reported that the Punjab government has included names of Saeed and one of his close aides, Qazi Kashif, in the fourth schedule of the Anti-terrorism Act. Three other men -- Abdullah Obaid from Faisalabad, and Zafar Iqbal and Abdur Rehman Abid from the Markaz-i-Taiba, Muridke -- were also added to the list. Saeed and the four men added to the fourth schedule of the ATA were also placed under house arrest on January 30 in Lahore amid an angry uproar from his party and political allies. The five men were identified by the Interior Ministry as "active members of the Jamaat-ud-Dawa and Falah-i-Insaniyat," the report said. The ministry directed the Counter Terrorism Department to "move and take necessary action" against them. The names of Saeed and 37 other JuD and FIF leaders had earlier also been placed on the Exit Control List, barring them from leaving the country. The Anti-Terrorism Act 1997 empowers the government to mark a person as "proscribed" and to place that person on the fourth schedule on an ex-parte basis. The mere listing of a person in the fourth schedule of the ATA shows that he is linked with militancy in some way, the report said. Those listed face a barrage of legal consequences like travel bans and scrutiny of assets etc. The action against Saeed was taken after the country was hit by at least eight terror attacks which killed more than 100 people. "Detention of Saeed shows that army supported the step by the civilian government, and it was viewed by many as a sign of changing security priorities," the daily said. Saeed was also put under house arrest after Mumbai terror attacks in November 2008 but he was freed by court in 2009. Saeed also carries a reward of USD 10 million announced by the US for his role in terror activities.